There was a lot happening today. New department directors, new protections for domestic workers, support for dairy workers, discussion of the proposed Waterfront LID, and what SPD is doing about recent “shots fired” incidents in the Central District. This afternoon, the City Council confirmed the appointments of Calvin Goings as Director of the Department of Finance and Administrative Services, and Andres Mantilla as Director of the Department of Neighborhoods. The Council sent to both nominees letters detailing the Council’s expectations for each of them. Here are the ones to Goings and Mantilla. This afternoon, the Council also passed a change to the city’s human rights code to add protections for domestic workers against harassment, sexual harassment, and discrimination. The change goes into effect on July 1, 2019, to align with the recently-passed “Domestic Workers’ Bill of Rights,” and gives the Council time to appropriate funds to pay for implementation and enforcement. Council President Harrell announced that tomorrow his committee would be taking up again an update to the city’s surveillance legislation, saying that they had reached a “great compromise” with privacy advocates including the ACLU. Council member Sawant that she would be hosting coffee for District 3 residents to discuss housing and renter issues. The session will take place this Saturday at 10am, at Squirrel Chops. Today the Council passed a resolution, introduced by Council member Mosqueda, articulating the Council’s support for diary workers who will undertake a 5-day hunger strike starting Thursday to protest their oppressive working conditions. Several individuals spoke during this afternoon’s public comment sessions detailed the conditions that dairy workers face and the limited protections they have. They had harsh words in particular for local dairy company Darigold. Council member Mosqueda announced that her committee meeting on Thursday will include an annual report on Yesler Terrace, a report on the Office of Housing’s Race and Social Justice Initiative plan, and a continuation of deliberations on the nomination of Debra Smith as CEO of Seattle City Light CEO. This week’s conversation with Smith will cover energy conservation, environmental justice issues, and workplace issues. Council member Johnson announced that his committee will meet Wednesday morning and discuss curb ramp requirements, the proposed design guidelines for South Lake Union, a public hearing on the extension of the moratorium on commercial development in the Aurora-Licton Springs Urban Village, and the UW Master Institution Master Plan. If there is additional time, they make also take up the proposed changes in tree regulations. Johnson also noted that last week Sound Transit voted to begin preliminary engineering work on the 130th Street station, so that if funds become available it could open at the same time at the Lynnwood Link. Council member Herbold noted that her committee meeting on Friday morning (which will begin at 9am instead of the usual 9:30) will take up a review of the funding for the Office of Film and Music, SPU’s water system plan, changes to SPU’s drainage and wastewater rates, and a long list of appointments. This morning City Hearing Examiner Ryan Vancil delivered a report on the public comment period he moderated on behalf of the city related to the proposed Waterfront LID. His report includes all 333 of the comments received (email, letter, group petition, and verbal comments). He noted that in general those who were opposed to the LID expressed support for the improvements, but concern about a perceived unfairness in who was paying for it. Marshall Foster from the Office of the Waterfront said that the Mayor would be transmitting legislation in the next 4-6 weeks to begin the Council’s legislative process for formally establishing a LID (if it chooses to do so). This morning, Council member Gonzalez noted that several residents of the Central District have contacted her office to voice concerns about a recent spate of “shots fired” incidents in their neighborhood (Council member Sawant said that her office had been contacted by constituents too, and is responding to them). Gonzalez said that she has been in contact with SPD Chief Carmen Best to discuss the situation, and was briefed this morning. She said that SPD is aware of the issue, understands what the problem is, and is prioritizing the issue; they are targeted incidents not random acts, and are “regional issues.” Sawant referred to them as “gang-related” and reinforced that they require a regional response. There is no additional information I can share with you about these incidents in the Central District due to the sensitive nature of law enforcement operations. I can, however, provide you with the attached statistical information that the Seattle Police Department compiled and provided to me that I will be sharing with constituent’s in the Central District. If you have specific questions about the cases or the attachment, I’d ask you to contact the SPD’s PIO. At this juncture, I have confidence that SPD is allocating resources to this specific area of the Central District in a manner that will minimize the ongoing risk of additional shootings and related injuries. The public should be aware that these are targeted incidents of gun violence and SPD is working closely with regional law enforcement agencies and community partners to diffuse the tensions that are contributing to the violence. Neighbors should continue to call 911 to report any actions they believe seem out of the ordinary. The SPD has additionally committed to curating a list of neighborhood-based, violence prevention organization’s that community members can engage with on a long-term basis to help build social cohesion that will interrupt these episodes of violence now and in the future. When we examine the reports of shots fired (see dashboard image below), through 9/10 (this dashboard will be updated early on 9/17/18), there have been 5 additional incidents compared to 2017, due to a series of events in August. While these incidents are up, they are not at historically unusual levels compared to trends since 2012. One factor that makes these incidents particularly impactful is their relative concentration in a specific area (or two) instead of being spread out across the neighborhood. Additionally, given that most of the recent incidents are related to conflicts arising between groups/crews, they do tend to come in high frequency, short time periods. The Seattle Police Department closely monitors both the return of known violent offenders to communities across the city, and we work to stay informed about conflicts between groups operating on the street, particularly those who partake in violence. We are aware that a particularly violent individual recently was released from prison and has returned to the area. When this individual was incarcerated, there was a marked reduction in violence in the area. They are suspected of being connected to several recent shots fired incidents in the area. SPD is working with other local partners, as well as federal partners like the FBI Safe Streets Task Force, the U.S. Marshals Service, and the ATF Regional Gun Crime Task Force to locate this individual and to develop probable cause for this individual’s arrest. For the past few years, SPD has been an active participant in the Gun Crime Task Force. Our detectives are submitting every shell casing and gun recovered to the National Integrated Ballistic Information Network (NIBIN) to track which guns are being used in which crimes. This helps in both investigations and prosecutions. Working these avenues of investigation, this past week SPD, along with the King County Sheriff’s Office, made an arrest of a significant individual. This person being off the street will reduce the level of violence in the area. In other news, the continued outbursts of serial candidate Alex Tsimerman and failure, just absolute incredible failure of Council President Bruce Harrell are now before the State PDC. Nice going Bruce, nice going. One note on Darigold. When they still had a plant on Elliott years ago, management locked workers out over some dispute. It appears Darigold continues to use workers in the same vein. Since there are other dairies to purchase from, I have been able to avoid buying from them. The numbers for 2018 seem low to me, and the graph is misleading. I live in the Central District and I hear “shots fired” pretty much every week. I can think of at least 5 shootings in the last month alone (I witnessed one of them). Someone said the police don’t count these unless they hit someone or cause property damage, maybe that’s why these numbers seem low. And my understanding is that this past weekend’s shooting ended in a fatality, which is not shown here. Also it’s hardly fair to compare 2018 “year to date” against complete prior years … given we still have 3.5 months left it looks like the final numbers will reflect more like a 100+% increase over last year, instead of the ~50% shown. That feels more accurate to me and matches my experience living here over the past 3 years. Bottom like: Don’t just go by this report. Increasing gun violence in the Central District is a bigger problem than this report might leave you to believe. I think this report understates the problem. 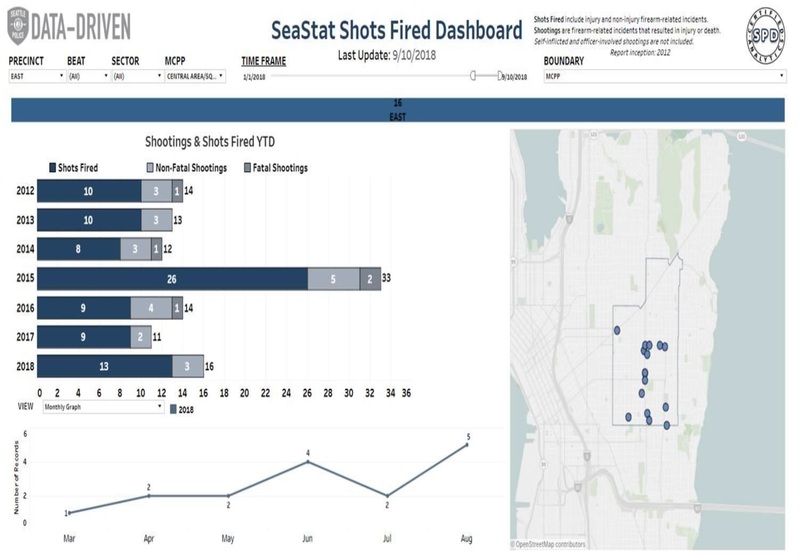 I don’t know where the “16” shootings this year in the graph comes from, but according to Seattle’s crime dashboard (https://www.seattle.gov/police/information-and-data/crime-dashboard) there have been 29 incidents of aggravated assault with a deadly weapon so far in 2018, and it is important to note that 2018 is far from over, and this only includes the incidents where police find evidence of a shooting (I now from experience that often we hear shots fired but the police find no evidence). At this rate it seems we could have over 40 by the end of the year, almost a 300% increase over the prior year and making 2018 the most violent year for the Central District on record. Just from a personal perspective, I have lived in the district for three years and I can tell you it sure feels like these incidents have really picked, particularly in the past month.